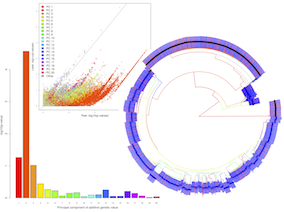 Virulogenomics is a Wellcome Trust and Royal Society funded research project to develop statistical tools for mapping the genes that influence bacterial phenotypes - notably virulence, the severity or frequency of disease. Nearly one hundred years of molecular genetics has led to a detailed understanding of important bacterial phenotypes, and many genes have been identified as potential virulence factors. By some estimates, nearly 5% of genes in some species could be involved in virulence. Popularly, a virulence factor is defined as a gene that is necessary for disease. In other words, disabling that gene prevents virulence in an experimental model. The aim of Virulogenomics is to identify virulence factors using a narrower definition - those genes that explain observable variation in virulence in natural populations. This excludes mutations induced experimentally that do not exist in natural populations, and therefore cannot explain why some bacterial strains cause more disease than others. Our starting point for developing tools for phenotype mapping in bacteria are the mature set of methods developed for Genome Wide Association Studies (GWAS) in humans. There are several important differences in the structure of bacterial populations and bacterial genomes that mean these tools cannot necessarily be applied unthinkingly to bacteria. We are developing computational analysis pipelines that implement a multifaceted approach to mapping bacterial phenotypes. You can download our tools here.